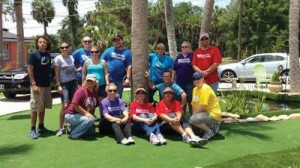 Members of Leadership Hillsborough lent a helping hand at My Warrior’s Place in Ruskin over the weekend. Sharon Ogle photo. Members of Leadership Hillsborough took their classroom outdoors last weekend to help build several projects at My Warrior’s Place in Ruskin, thanks to a grant from the Community Foundation of Greater Sun City Center. “I thought their vision of what they wanted to do out there for the veterans was something special,” said Dave Ramirez, a member of the 2014 leadership class who made the original proposal to the group to support My Warrior’s Place. “There were about three or four other proposals for programs … in the leadership group, but in the end we picked My Warrior’s Place,” said Ramirez, who is program director at the Gardenville Recreation Center in Gibsonton. My Warrior’s Place Inc. was established in fall 2012 as a tribute to Specialist Corey Kowall who was killed Sept. 20, 2009, in Afghanistan while en route to lend support at a location where an improvised explosive device had been detected. Cory’s mother, and founder of My Warriors Place, Kelly Kowall, in an effort to make a difference for other families and honor her son, created a way to assist those veterans who were mentally and emotionally affected by complex grief issues that arise when a warrior falls. Founded in 1989 to promote strategic alliances and enhance communication by unifying all sectors of Hillsborough County through encouraging interaction among business, professional and community-oriented individuals, Leadership Hillsborough is a nonprofit organization governed by a volunteer Board of Directors. Class members attend specialized seminars and training sessions to assist them in developing their leadership skills. Leadership Hillsborough’s nine-month program runs from September through June. It requires a commitment of half-day or full-day seminars approximately once a month, and weekend retreats at the class’s beginning and midyear. My Warrior’s Place’s mission is to provide a healing environment where veterans, military service members and families can go to remember their loved one, receive grief support and learn how to effectively cope with the loss of their soldier. Guests are able to stay on the 1.7-acre tropical retreat for as long as needed. While residing in one of its two homes and four RVs, guests are able to take part in one of the three programs offered at My Warrior’s Place: The Project Corregidor, Boating Experience, and Retreat Center. Due to limited funds at My Warrior’s Place, Leadership Hillsborough decided to adopt the organization and applied for and was awarded an $11,000 grant through the Community Foundation of Greater Sun City Center. The grant allowed the group to help build a new boating deck/dock, construct a putting green with landscaping to surround the new construction projects and provide minor landscaping projects throughout the property. For more information on Leadership Hillsborough, visit www.leadershiphillsborough.com. For information on My Warrior’s Place, visit www.mywarriorsplace.org or call 813-321-0880.